ATS is the most flexible Property Management Software to increase efficiency and performance. 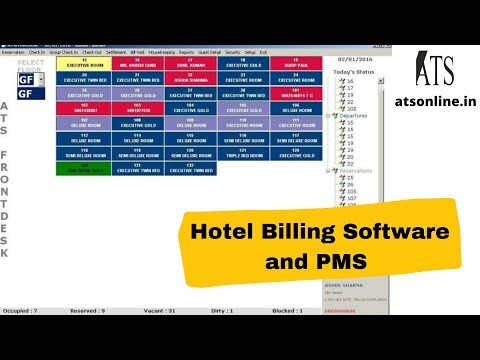 It is a full feature hospitality billing software with a usability point of view rather than a technical one. The solution is easy to use and the software is best suited for B2B properties. The software helps run property effectively. Advanced Technology Systems Company (ATSC) strives to bring the strongest services and solutions that fulfill and exceed our clients’ requirements in today’s ever-changing climate. Their goal is to effectively help our clients execute their objectives with the proper tools and applications for air, land, or sea systems, utilizing an expert multi-disciplined staff and stringent quality control to ensure total customer satisfaction. Guest Reservation with SMS , Email notification. Check in, Group check in, Guest search & directory. Check out Bill print and Print Preview. Multiple Outlets such as Restaurant, Bar, Room Service. Extra charges like Food, laundry ,Mini Bar ,Phone etc. Guest Snaps with Web Cam and document scanning. Guest Messages with SMS notification. Create unlimited Rooms, Room type and Rate type. Block Room Status & Wake up call.Room Shifting and Occupancy Report. Outstanding Bill receipt , Customer folio & Settlement.